These sites are available in sunny, semi-shaded and shaded areas. Full hook-up sites include: 30 – 50 amp electric, water, sewer, and one electrical pole. Sewer hookups are connected by a full property septic system, so there are no waste water limits or pump station visits required. While many of our Full Hookup guests enjoy this convenience, a pump station is still available. Pull-thru sites are available. Please make your preferences known to our reservation assistant and please make us aware of tip outs / slide outs and where they are located on your unit. Some sites are closer to bathhouses than others. Other sites are close to playgrounds. 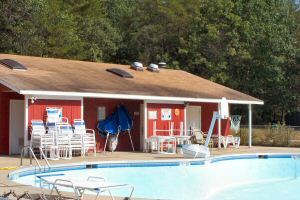 Each site is equipped with a picnic table and a fire ring. 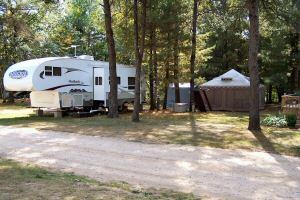 Ho-Chunk RV Resort is a "Pet Friendly Campground". If you are bringing along any furry friends, we ask that you review and follow our Campground Policies. to contact our friendly staff.